At BISCO, adhesion is our passion. BISCO prides itself on developing adhesive technology to best suit the dentist in their need for a test proven adhesive that every busy practice can depend on. BISCO adhesives offer the compatibility and durability to provide a foundation for success. For over 30 years, BISCO adhesives have been considered the industry’s “gold standards” against which all other adhesives have been compared. 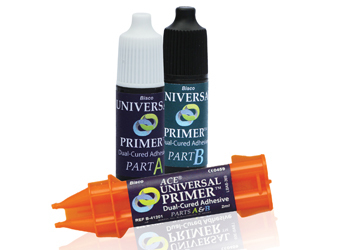 Bisco is proud to introduce Universal Primer™ a dual-cured adhesive/Primer. Universal Primer is for clinicians who prefer an adhesive/primer that does not need to be light-cured, fearing that the indirect restoration may not fit due to adhesive layer thickness. Universal Primer does not need to be light-cured for post cementation or under crowns, onlays, inlays, etc. and can be used in direct restorative procedures, such as core build-ups and composites. Universal Primer combines ease of use with virtually no post-operative sensitivity, and it is compatible with other cementation systems. Universal Primer is available in either a 2-bottle system or in a convenient all-in-one ACE® cartridge system and as part of the Duo-Link Universal with Universal Primer Kit. Copyright © 2018 Decisions in Dentistry. All rights reserved.